I am using High Sierra 10.13.6, and I have no audio (I also have no /dev/dsp or /dev/mixer devices). I did a custom build of Basilisk II and it had the SDL patches, audio works great! Sound works fine here on macOS 10.13.6 and with Mac OS 9.0.4. Try: In Sound control panel select Built-in for Output and select a sound in Alert Sounds. Sound works here in 9.0.4, 8.6, 8.5.1, 8.1 and 7.5.5. I cannot imagine how it could not work in 9.0 only. Did you follow the advice in my previous post? 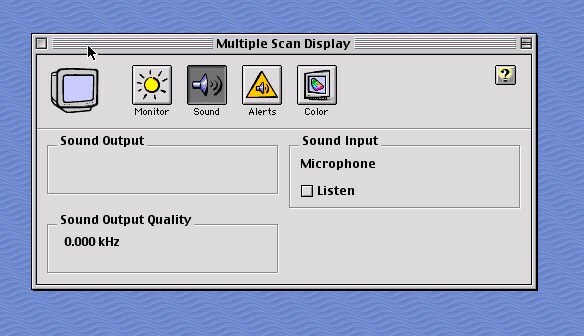 In Sound control panel (in Mac OS 9) select Built-in for Output and select a sound in Alert Sounds. No, you have no sound devices. The items in preferences are a relict from the Linux origin of SheepShaver. Should I leave out /dev/dsp and /dev/mixer entirely? The location of the Sound control panel differs in different Mac OS versions. This is apparently Mac OS 8.5 or 8.6. In those OS versions the Sound control panel is installed in the Apple Extras folder. You can use it there to select Built-in for Output and select an Alert Sound. Irrelevant. It does nothing there. Last edited by Ronald P. Regensburg on Tue Jul 17, 2018 12:10 pm, edited 1 time in total. Is it possible because I was using 24bit sound? In my 8.5 and 8.6 installations sound quality is set to 44.100kHZ. Probably the default, because I never changed sound settings in the Monitors and Sound control panel. For sound I only used the Sound control panel in the Apple Extras folder to enable sound. OK, after switching back to 16bit 44.1KHz sound (in macOS High Sierra), I have sound in all versions of SheepShaver. Sadly, your latest test build is crashing at Finder?! Dunno if it is a dsk format related error, but the original build of SheepShaver I had (which is almost certainly your build too) is working fine. I corrupted my DMG formatted drive that was full of software somehow (force-quit) - Think there is any way to recover it? Thanks heaps for the help - I have sound again in SheepShaver AND Basilisk II !!! PS. Do you have a build that still has Dynamic screen refresh rates? Did this this latest test build run before and does it crash now? Do you recall if you had "Ignore Illegal Memory Accesses" enabled in preferences (as it should be)? The file will open in your default text editor. Select all content and copy and paste it here in your reply. If you have backups (Time Machine or otherwise) you can easily recover a previous version of the corrupted DMG. All builds since many years can be and should be set to Dynamic screen refresh, also the latest test builds. A difference that you may notice is that SheepShaver now uses its own ("software") cursor inside its window and not the host's ("hardware") cursor. Last edited by Ronald P. Regensburg on Tue Jul 17, 2018 1:08 pm, edited 2 times in total. You really should have read the setup guide and follow the instruction there. Two important settings are not correct. 1. In Preferences > Audio / Video the Refresh Rate should be set to "Dynamic". The low refresh rate you use now will make things feel very slow. 2. In Preferences > Miscellaneous "Ignore Illegal Memory Accesses" needs to be enabled. Without it you may experience SheepShaver crashes that can be avoided with this setting. 3. It is not a good idea to have all of your host's disk assigned as "Unix Root". Better create a separate folder to be the shared folder. There is no "Dynamic" in the popup list... I am using SheepshaverPrefs app to set preferences. Can I just type in Dynamic in a text editor? Do not use that old prefs editor. It is obsolete and incomplete. It may be useful only when for some reason SheepShaver itself cannot be launched. Use the built-in prefs editor: SheepShaver menu > Preferences. And as you apparently do not like studying the setup manual: After saving changes in preferences, quit SheepShaver and launch it again. Many many thanks for your awesome support of this app!! !